A specialist dust extraction firm in the UK has launched a new mobile extractor that offers improved mobility and easy transport for on-site use. The DC Storm provides the same high level of extraction power of previous Dustcontrol UK models, but its compact height allows for easy transport in regular-sized vans and trailers, making it perfect for the hire industry and wider construction industry. Able to handle the fine dusts and materials created through common construction techniques, the DC Storm can be connected to floor grinders, cutting tools, chisel hammers, saws and more. Many different models of the DC Storm are available, but all feature a direct-driven, three-phase turbo pump suitable for continuous operation, heavy material transport, spot extraction and cleaning. The pump also provides sufficient airflow for simultaneous multiple use when used as a central unit in a semi-mobile system. It’s durable design and sturdy steel chassis helps to ensure its longevity. As standard the machine is equipped with a patented semi automatic reverse pulse filter cleaning system and an HEPA 13 filter. It is built to Application Class H, unlike many other products, which are only M class standard. The use of H13 filters guarantees 99.97% capture of all particles greater than 0.3 microns meaning air exhausted from the Storm is the cleanest it can be. A gauge shows when it's time to activate the filter cleaning. 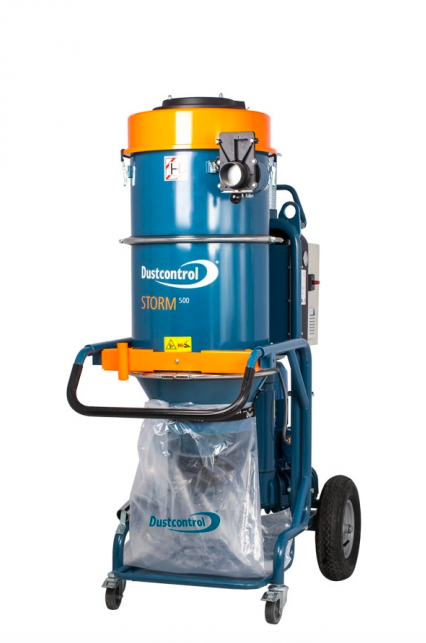 Dustcontrol UK, based in Milton Keynes (UK head office), has developed a series of mobile dust extractors and air cleaners specifically designed for the construction industry to capture fine and hazardous dusts, such as silica dust.